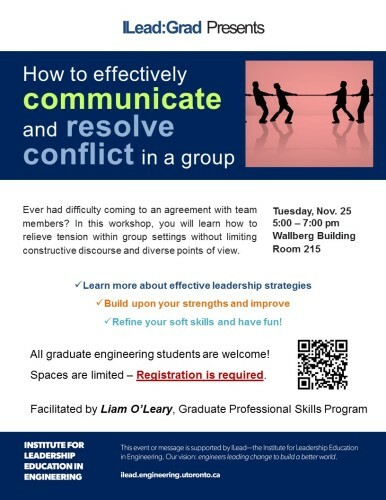 ILead:Grad is hosting an Effective Communication and Conflict Resolution Workshop next Tuesday! Learn how to relieve tension within group settings without limiting constructive discourse and diverse points of view. The event will take place on Tuesday, November 25 at 5:00-7:00pm in the Wallberg Building, room 215. The workshop will be facilitated by Liam O’Leary, Graduate Professional Skills Program. All U of T engineering graduate students are welcome! Please RSVP here in order to attend – spaces are limited.